Is The Hose Co. No. 3 - Fire Museum HAUNTED ? ? ? 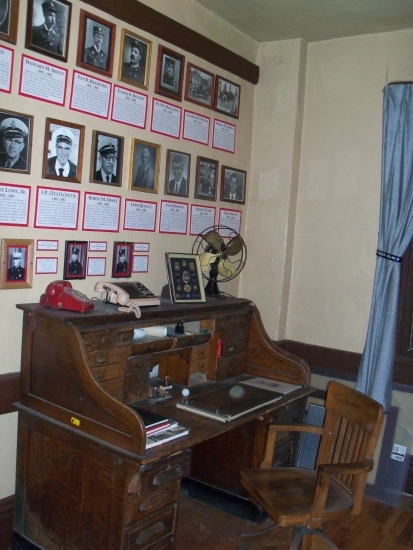 Stories of Fire Station 3 being haunted stem back to the 1930's (or maybe earlier). The building was designed and built by local architect and contractor, John. F. Bishop and completed in 1895. On August 7, 1904, Mr. Bishop was tragically killed in the Eden Train Wreck, the worst railroad disaster in world (in terms of fatalities) up to that point. 96 people were killed (officially, 106 according to the final newspaper tally at the time) when rainstorms washed out the Eden bridge, causing the train to derail. This happened just eight miles north of Pueblo. Mr. Bishop was travelling with his sister Etta, who also died in the accident. One story that was told around the fire station happened before my dad's time (he joined the department in 1962) but was passed down among the firemen. It was said that a handprint would appear on the window at the top of the stairs. They would wash the window, getting rid of the handprint, but it would re-appear within hours. They thought it was a prank, but this went on for months. They even went so far as to replace the window, thinking there was some kind of defect when they manufactured it. But the story goes that the hand print re-appeared on the new window, though less and less frequently, and quit all together a year or so later. Appropriately, our "Line of Duty Deaths" are on the wall just to the left of the "HANDPRINT" window. The window at the top of the stairs. Another wierd event happened, this one reported in the newspaper. Back in the early 1960's,one morning about 3:00 a.m. as the firemen slept upstairs,the 1960 Seagraves truck (that is now owned by the Pueblo FireFighters Historical Society) started itself up, ran through the door and out into the street. They figured the truck was left in first gear, and although it had been several hours since the truck had been running, the magneto must have held a charge that discharged, starting the truck and driving it 20 feet into the street. It only added more mystery and mystique to the fire house's legend. The above picture is of the Seagraves truck out in front of Station 3. The photo was taken in the 1970's. And then there was. . . . . The Model T at the "Firefighter's Banquet" at the Union Depot, almost a year to the day before it was wrecked in the "Incredible Ride." 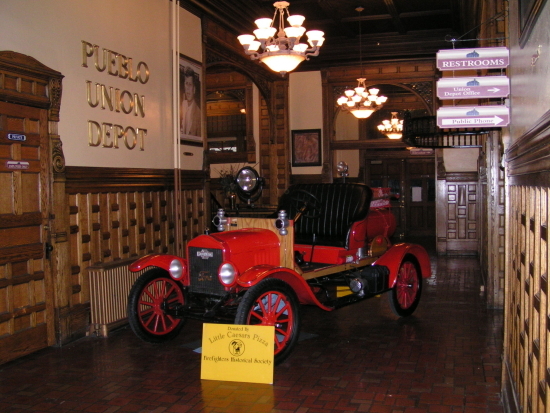 On the day of the annual "Firefighter's Banquet" in Pueblo in 2006, several items were being transported from the museum to the Union Depot (where the banquet was being held.) This was about 10:30 in the morning, a gorgeous spring day. 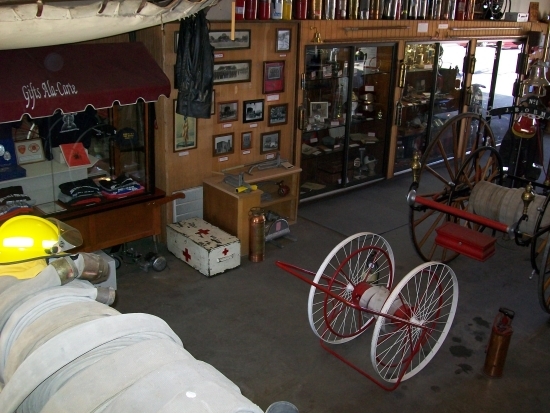 One of the items to be displayed was the Orman Hose cart. In order to get the hose cart out, the Chief's Model T car needed to be moved. It was hard to start, being converted to a power start, but the battery was low. Once they got it started, they drove out of the station up Broadway Ave., turned left at Evans Ave. and up half a block to the entrance of the parking lot that sits behind the museum, the Mason's Hall, and the Davis Mortuary building. The Model T was driven to the end of the parking lot next to the alley, and pulled around to face back out. It was left idling to charge the battery. One of the firefighters backed a flat bed truck into the truck doorway of the fire station, to make it easy to roll the hose cart onto it. As they prepared to load the cart,one firefighter said he saw a "flash of red" before there was a terrible crash. The flatbed trailer jolted violently, startling the three firefighters there. The Model T was parked roughly where the silver car is, though was probably angled more towards the camera in the left picture. In the right picture, the witness was in the red brick building in the upper left corner, and their van was parked at about that last bush. A couple living in the apartments on Evans Ave. (up from the parking lot) saw the car take off. Their van was parked at the far end (towards Evans) of the lot, next to the apartments. The Model T was headed straight for the van. The woman said she thought someone was driving the car with a remote control, because they could see that no one was in the driver's street. When the woman exclaimed "That's going to hit our van", and she later said at that precise moment, the car turned sharply to the right. Now in between the entrance to the parking lot and the Davis Mortuary building are a half dozen headstones set out near the curb on Evans. There's a gap of about 6 feet in between the line of headstones and the building, where the sidewalk is. The car traveled straight through the narrow gap (you could see the tire tracks where they went across the sidewalk), staight for or so feet down the curb and onto Evans Ave. The car went down the driveway in the left picture and headed up to the stop sign, where it took a right. In the right picture, you can see the intersection that the Model T traveled on this Saturday morning. You can see the museum building on the far left of the right picture. The witnesses said it then turned straight onto Evans, went another 20 feet before suddenly turning right onto Broadway, running the stop sign. They also said it was picking up speed at this point. Now at the main truck room door down the block,one of the firefighters had his truck attached to the flat bed trailer that was sitting a few feet inside the station. His truck was out in the street a bit, but mostly on the 8 foot sidewalk between the station and the street. Other witnesses across the street at the Broadway Tavern said they notice the Model T driving down Broadway, relatively straight. Now remember, this was in the late morning on a Saturday in March. The patrons of the tavern said the car traveled thirty feet before turning back towards the driveway of the station. The Model T traveled down the center line before veering into the bay door of the old fire station. The right picture is looking up from the corner of the museum building. The firefighters truck was parked right behind the sign, and the front of the trailer sat about where the curb did. The inpact point is where the concrete makes a +. The Model T even missed the curb and the truck attached to the trailer. But it was going home. It crashed into the front end of the flat bed trailer doing close to 20 miles per hour, going back into the station. It touched nothing else on it's long journey, but was within 5 feet of getting back into the station. It did extensive damage to the Model T's front end, puncturing the radiator, breaking a headlight, and damaging the engine cowling, and bending the steering framework. The damage has since been repaired and the Model T restored to fine condition. 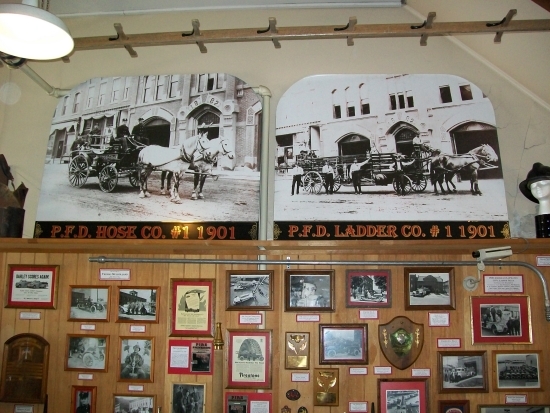 This solidified the reputation of the building with the modern firefighters associated with the museum, and especially the three that were there that day, Kan Kilcullen, Gary Micheli, and Rick Mark. So much so, that professionals were called in. The ghost hunting team from Ark Paranormal was the first paranormal group to visit the museum. Although they didn't capture anything on film or recorder, they did have a strange experience the night they stayed in 2006. They were leaving to get some coffee at about 10:30 that night when they exited the museum through the small door to the alley. They had already locked the deadbolt, and wondered if they left the digital recorder running. When one of them tried to put the key in, he said it felt like somebody was trying to push it out. He finally got the key in, heard the deadbolt unlatch inside the door, but he couldn't push the door open. He tried harder, and said he felt give in the metal door, but it was like someone was pushing the door shut from the inside. He reinserted the key with some difficulty again, wondering if the lock was still engaged, heard it reengage, then disengage, but the door still wouldn't open. They locked the door again, and decided to go get some coffee. When they returned, the key went in with no problem, the door opened as it should, and nothing else remarkable occured. The second paranormal team was the Boulder County Paranormal group, headed by a firefighter from Boulder, Richard Estep. He and his team spent the night in the museum, and an article was written in the Pueblo Chieftain about their visit and the museum being haunted. They started out by taking readings with an Electro Magnetic Field (EMF) meter and got readings right away in the northeast corner of the building (right by the pole. )There is the old Gamewell Telegraph Alarm base station in that corner, but no electricity running there. It had higher reading than on the east side of the building, which was strange because there are high power electrical lines running down the alley on the east side of the building, and a big transformer on a pole on the north east corner, but the readings spiked definitely higher in the northwest corner. They didn't receive higher readings until they went upstairs in that same corner of the dorm room.But they received much higher reading in that corner also. They also recorded a 10 degree temperature drop in that corner for a couple of minutes. They also didn't get anything on audio or video, but were eager to spend the night. The team then bed down for the night. After an hour, they said they heard footsteps at the base of the stairs, and one of the members heard breathing by the pole upstairs where she was at, though recordings never verified the sounds. In 2009,a visitor to one of our Open Houses in May had a strange occurance with her camera. She was a friend of a Pueblo Police officer who's father spent 30+ years on the Pueblo Fire Dept. At the top of the stairs, she went to take a picture. She had replaced the battery earlier in the day, and had taken a few pictures on it. When she tried to snap the picture, the camera told her that the memory card was full. She checked to see how many pictures were taken, and it showed 7 pictures taken. She had a 4 MB card in the camera, which should be good for hundreds of pictures. When she switched the camera back to take a picture, it showed the memory card full again, then it shut itself off. She thought maybe the camera had been left on (even though it had an automatic shut off) and went downstairs to her car to change the batteries. She decided to check the battery strength when she got in her car before she changed them out, and it showed full batteries and was working like it was supposed to. She even snapped a couple of pictures down on the street to make sure. She grabbed the extra batteries anyway, and when she returned to the top of the stairs to take the picture, the camera shut off, three different times. She replaced the batteries and the camera worked fine after that. So was it low batteries, or something else. In May of 2010, we had our annual open houses (2 weekends out of the statewide Historic Preservation Month we open the museum.) I snapped some pictures of the museum during one of the weekends. I didn't give them much thought until a recent visit to the Stanley Hotel in Estes Park, Colorado, a reputed haunted place that inspired Stephen King to write "The Shining" after staying there. But we found some strange orbs in the pictures from the Stanley, which we sent to them. But my girlfriend and I stayed at the museum on October 30,2010, took pictures and a digital voice recorder ran all night. The voice recorder captured several strange occurances, and can be found at the bottom of this page. The pictures also captured orbs. So I looked back at the pictures I had taken the previous May, and sure enough I found orbs in them. So below are the pictures I found with orbs in them. The pictures weren't taken in order, there were several pictures that were taken in between these that had nothing on them, plus the different locations of the orbs rule out something on the camera lens. The first picture is uncropped, and the next picture(s) are the close up of the orbs. You can see the orb in the upper left corner of the picture. This is below the staircase (you can see the base of the staircase in the upper right corner. 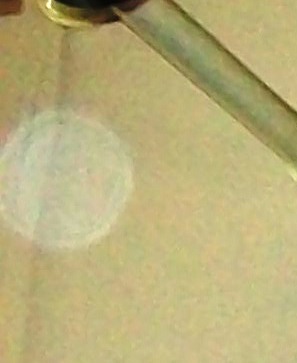 Close up of orb in above picture. This was taken looking down from the stairs. 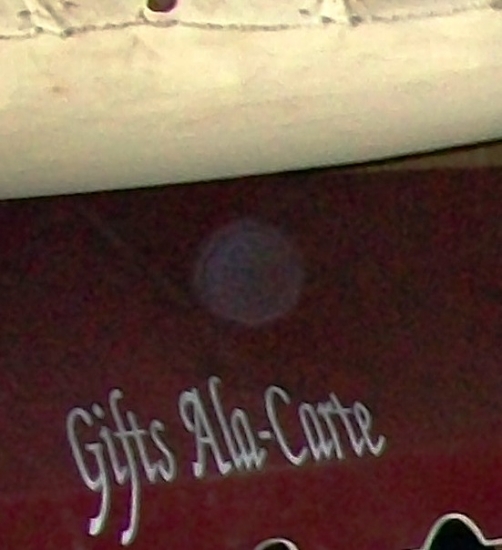 The orb is in the upper left corner again, on the canopy or our merchandise cart, above the "Gifts Ala-Carte"
This is a close up of the above picture. Almost looks like a skull to me. This was taken in the Chiefs Office on Dec. 18, 2010. You can see the orb sitting on the log book. 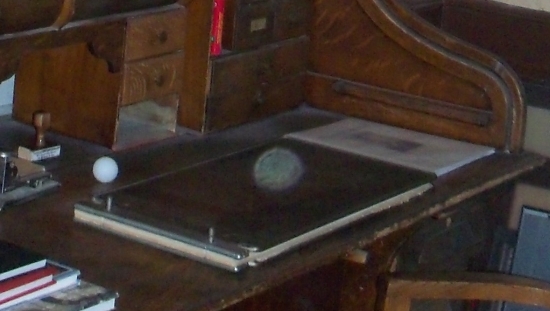 Close up of orb on the desk of the Chief's Office. That is a ping pong ball to the left of the orb. Here are the pictures that were taken October 30, 2010. If it looks somewhat blurry and dark I was taking the pictures with the lights off hoping to catch something, and something I did catch indeed. There are two orbs to the right of the drapes, this is also at the top of the stairs. Here are close ups of the orbs in the above picture. You can see something on the throw rug in front of the cabinet. I didn't have any other pictures of the rug, but after looking at the pictures and going back to the museum a few days later, I didn't find anything on the rug. Close up of orb on the throw rug. This was taken in the Chief's Office room. 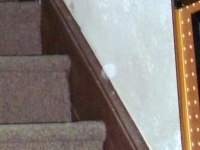 This picture looking up the staircase has several orbs in it. There are a couple of orbs above the doorway to the right of the window, one near the bottom of the right doorframe (there is no spot there), and one right next to the handrail. You can click on any of these close ups to get a better view of them. You can click on these close up pictures to enlarge also. Here is a picture of the wall on the staircase. The paint has peeled away in this fashion with no help or prompting. In fact, this was noticed by a visitor to the museum before it becoming obvious to the staff of the museum. 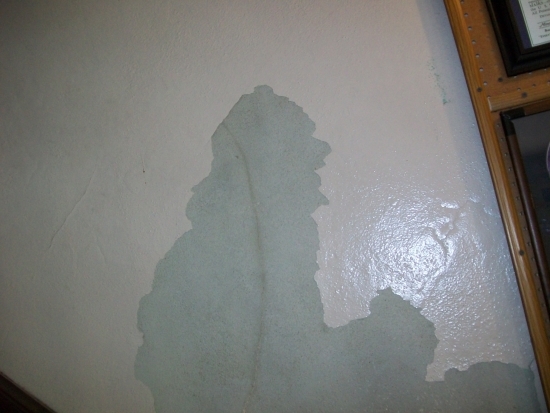 The moisture line in the center of the wall may explain why it peeled, but the way it peeled can't be.